Kikuyu grass has been highly popular as an all-round Australian lawn for as far back as memory can go. It is inexpensive to purchase, is quick to propagate into new lawns, requires minimal lawn care to remain healthy, and grows and repairs quickly. 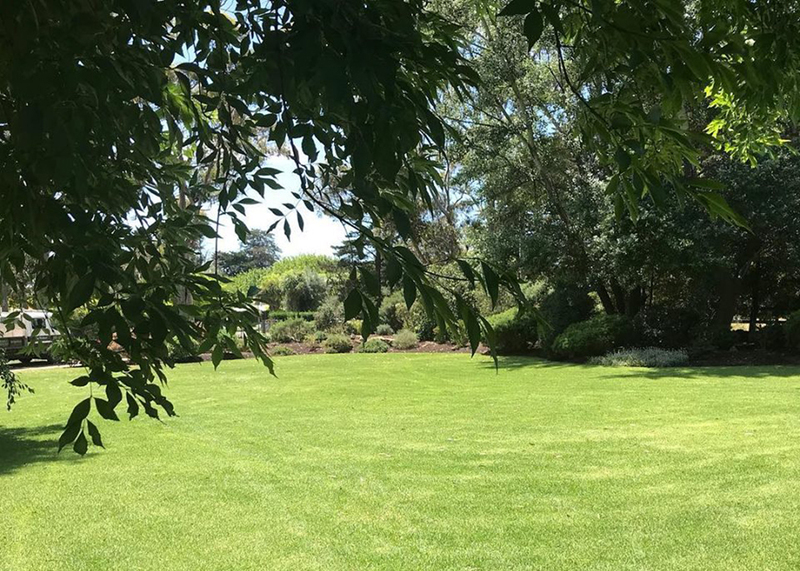 In fact, Kikuyu has always been the number one choice for any lawn areas which are expected to be under heavy wear and tear conditions throughout its life, as this grass repairs itself quicker than almost any other grass. Kikuyu lawn is widely used as the first choice for many community recreation areas and schools in many states. The reasons for this choice are the same as listed in the attributes just mentioned, with the primary reason being it’s quick repair capabilities, as required by these heavy duty usage areas. An ideal variety choice is Kenda® Kikuyu. Just as Kikuyu is used for very high traffic and usage areas in the community due to its fast repair capabilities, this is also the same main reason that many homeowners choose a Kikuyu lawn. Having busy kids playing cricket or slip and slide in the summer in the backyard, or active dogs which run amok seven days a week, means nothing will beat Kikuyu for it’s repair from damage at fast rate capabilities. Indeed, Kikuyu can keep up with the busiest of backyards. Other people will also like Kikuyu for its soft leaf, which also makes for an overall soft lawn, or for its bright green colour. Which when cared for properly, and mowed properly and regularly, can make for a beautiful lawn. Just like all grasses, Kikuyu too does have its negative sides which also need to be taken into account. The grass is very quick to repair due to it’s fast growing nature, meaning it will need to be mown more regularly than other grass types. However, if you do find your Kikuyu lawn growing too fast for your liking then you can slightly reduce watering and fertilising to slow the growth rate. Common Kikuyu’s fine seed head means that it is easily spread onto other surrounding lawns, and into native vegetation. It’s for this reason, that as homeowners, if you are to plant a Kikuyu lawn, then it’s always wise to choose a Male Sterile Kikuyu. A Male Sterile Kikuyu is far less likely to produce viable seeds heads, which in turn makes these lawns far less likely to establish into any area where they are not intended.